Once again, thoroughly enjoyed class today, and I hope you did as well! The Gansey Sampler Welts prep-ed for joining. Where we are so far! We have joined the Garter Ridge Welts in the round; knitted the traditional initial(s) into the otherwise overall stockinette stitch lower section; next - the "definition ridge" and finally the beginning of the pattern section and underarm gussets! Detail of the pattern section just above the "definition ridge". 1) Raised Increases – Okay, so in my preliminary video search for these I found no videos demonstrating the way Beth does it in her book. Not a problem. For this, review page 56 for her instructions on the left leaning and the right leaning increases. You shouldn’t have any problems – but if you do, let me know! 2) Okay… for the Cable video demo I found a video of the “Baby Cable” – YouTube – Knitting – Making Baby Cables – English The one Beth uses in the Gansey Sampler is the “True Cable” See page 58 for the very minor difference. Either works great! 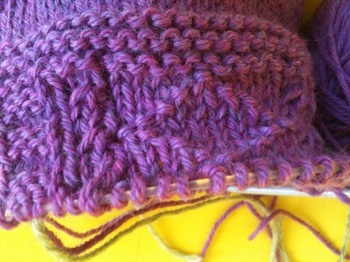 3) Knitted Cast-off – I didn’t actually find a video to show this technique via video; but for review, you are doing your typical cast-off using waste yarn for the gusset stitches, including the side seam purl stitches. 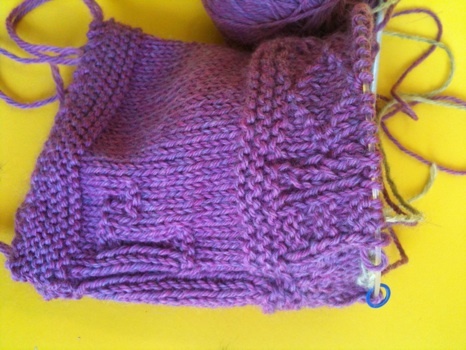 You can also just put these stitches on a holder as Beth suggests and you can always thread them on a piece of waste yarn as well – let me know if you have any questions. 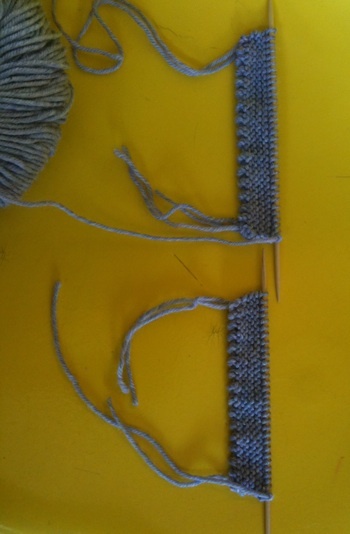 An Example of the Provisional Cast-off used to put underarm gusset stitches on hold. 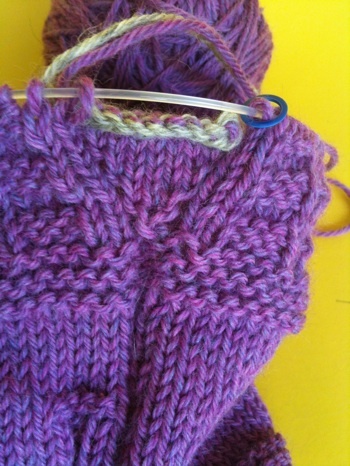 You can also see the Right Leaning and Left Leaning Raised Increases on the gusset section. Knitting – Complete the front and back sections including lower portion of gusset; then put gusset stitches – including side seam stitches on holder or do provisional cast off with waste yarn; lastly, complete the front and back “bib” sections of sweater refering to the Gansey Sampler Graph diagrammed on page 69. Don’t forget – this is your Gansey Sampler – Do As Much As You Please! Remember to let me know what you both would like to do regarding scheduling our next class time. Again, feel free to contact me with any questions/comments.